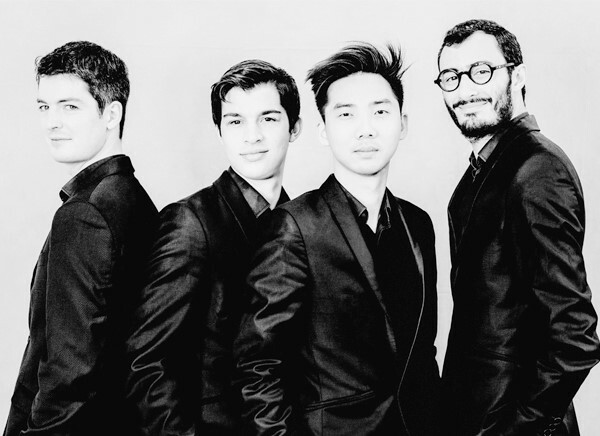 Founded in 2013, the Quatuor Arod benefited from the teaching of Mathieu Herzog and Jean Sulemas well as the Quatuor Artemis at the Queen Elisabeth Music Chapel in Brussels. It has also worked regularly with the Quatuor Ebène and the Quatuor Diotima. In 2016, it won the First Prize at theARD International Music Competition of Munich. It had already been awardedthe First Prize at the Carl Nielsen International Competition of Copenhagenin 2015 and the First Prize at the European Competition of the FNAPEC Concours in 2014. In 2017, they were named“BBC New Generation Artist” for the seasons 2017 to 2019, and ECHO Rising Star for the season 2018-2019. The Quatuor Arod collaborates with such artists as the violists Amihai Grosz, Antoine Tamestit, Timothy Ridout and Mathieu Herzog, the pianists Eric Lesage, Alexandre Tharaudand Adam Laloum, the clarinettists Martin Fröst, Romain Guyot and Michel Lethiecor else the cellists Raphaël Pidoux, KyrilZlotnikov, Camille Thomas, François Salque, Jérôme Pernoo and Bruno Philippe. In 2017, it premiered the French composer Benjamin Attahir’s first string quartet (commissioned by La Belle Saison, ProQuartet and the Quatuor Arod). The Quatuor Arod records for the Erato Warner Classicslabel. Its first Mendelssohn albumcame out in autumn2017.Its new album, devoted to the figure of Mathilde Zemlinsky, with the participation of the soprano Elsa Dreisig (Schoenberg, Zemlinsky and Webern) will come out in autumn 2019. The Quatuor Arod is in residency at the Fondation Singer-Polignac and at ProQuartet – CEMC. It isan HSBC award-winner from the Académie du Festival d’Aix, and the Fondations Banque Populaire and Safran. It is supported by the ADAMI and the PACA region. The Société Générale’s Musical Sponsorship programme is the Quatuor Arod’s main benefactor. It is dressed by “Blandin et Delloye – Paris”.